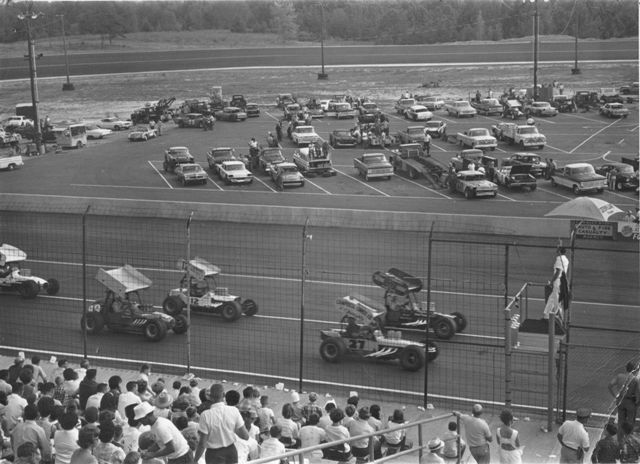 As Told by Donald Weathersby: The great flagman Tommy Swilley gives the one more to the field, Bobby Harrell in the 57 on the pole, Gene Tapia in the 27, Armond Holley in the 12, Ikey Jerome in the 99, Ival Cooper in the 248, and I think Ellis Palasini in the V8. This is a picture my brother Phillip and I got from Bill Gupton, who left us all with many great memories and photographs of Jackson International Speedway. He and his wife were always very nice to us. How fortunate we were to have such a great track, professional flagman, a great photographer,and those brave men (who are our heros) who drove those very special cars. We were in the stands with our friends for every race and made many friends at JIS. The best chili dogs and coldest beer. Thanks for Miss Chicken.com and to all those who sent in picture. I thought I'd never see all those cars and drivers again. If they ever invent a time machine, you can find me at JIS or The Jackson Sports Arena. The 44 is the car that set the World Record half mile lap. Ikey Jerome and the Wesson Racing Club rear engine Super Modified.